A RARE SIGHT: Charger stations for electric cars are still few and far between, but a bill proposed by Rep. Peter Welch, D-Vt., would extend subsidies to build more. 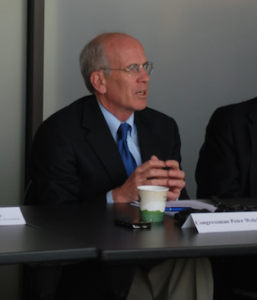 Last week at an electric car charging station in Burlington, Rep. Peter Welch, D-Vt, announced legislation to expand subsidies for the electric vehicle market. The federal program currently has a cap limiting the taxpayer dollars that may be used to incentivize EV purchases. “Transportation is the single largest contributor to greenhouse emissions in the United States. It is urgent that we transition to cleaner, more efficient modes of transportation,” Welch said at the event. While buyers of electric vehicles currently may receive a federal tax credit of up to $7,500 to offset the higher cost of the cars, automakers each have a cap that limits the offer to only 200,000 cars. Some automakers expect to hit that cap this year. U.S. Rep. Peter Welch, D-Vt.
To free up even more taxpayer subsidies, Welch’s legislation, H.R. 6274, would eliminate the cap for 10 years and enable buyers to get the credit at the time of the purchase instead of having to wait until they filed their annual income tax return, as the law currently requires. In attendance at the event was Dave Roberts, senior consultant for Drive Electric Vermont, a nonprofit advocacy organization formed by state agencies and the Vermont Energy Investment Corp. He told True North why he supports the proposed changes. “We know that the upfront cost is one of the largest barriers to EV purchases for consumers, and so this is an important way to keep this market going until the costs come down enough that we hopefully no longer need these types of incentive programs,” he said. Another piece of Welch’s initiative is to offer a tax credit to purchasers of vehicle charging stations in hopes of incentivizing the buildout of a charging infrastructure across the country. Roberts said that part entails a 30 percent credit on the installation cost for EV charging. Regarding the bill’s intent to let buyers to obtain the tax credit at the time of purchase, Roberts said that was put in for lower-income people who don’t pay much in taxes, and therefore wouldn’t likely benefit from a tax credit. “Being eligible to apply at the point of sale is opening up the credit to a broader array of potential customers,” he said. The news comes on the heels of an announcement from Tesla Motors last month that the EV manufacturer is laying off 9 percent of its workforce, about 3,600 workers. Roberts said Tesla’s decision does not signal an overall negative trend for the EV industry. “Tesla is a unique case, they are starting from scratch as the new automaker at the high end and they are working their way towards more mass-produced vehicles,” he said. “They have quite a bit of pressure from investors that their company be profitable, and the cuts that they made seem to be part of a strategy that unfortunately a lot of businesses go through in terms of increasing profitability,” he added. The assertion that electric vehicles are more “green” than their gasoline-engine counterparts has come under increasing doubt in recent years. Researchers who add up the CO2 and other emissions involved in producing the vehicles and delivering electricity to their giant batteries have found little environmental benefit, British daily newspaper The Times reported last month. Tesla’s vehicles “may be behind the production of just as much greenhouse gas as their petrol and diesel equivalents,” the newspaper reported. Roberts acknowledged controversies related to materials in the batteries, the energy and materials used to make the cars, and the dependence on electricity as power. However, he said an analysis by the Union of Concerned Scientists found that electric cars are a cleaner alternative. “Even an EV running on coal is, according to UCS, cleaner than the average gasoline vehicle on the road,” Roberts said. Marilyn Miller, executive director of the Vermont Vehicle and Automotive Distributors Association, also attended the event in Burlington. She said Welch’s bill is fitting for Vermont, which is actively backing electric modes of transportation. H.R. 6274 is cosponsored in the U.S. House by Reps. Jacky Rosen, D-Nev., and Jared Huffman, D-Calif. In the U.S. Senate, Sen. Rep. Jeff Merkley, D-Ore., is expected to introduce similar legislation. 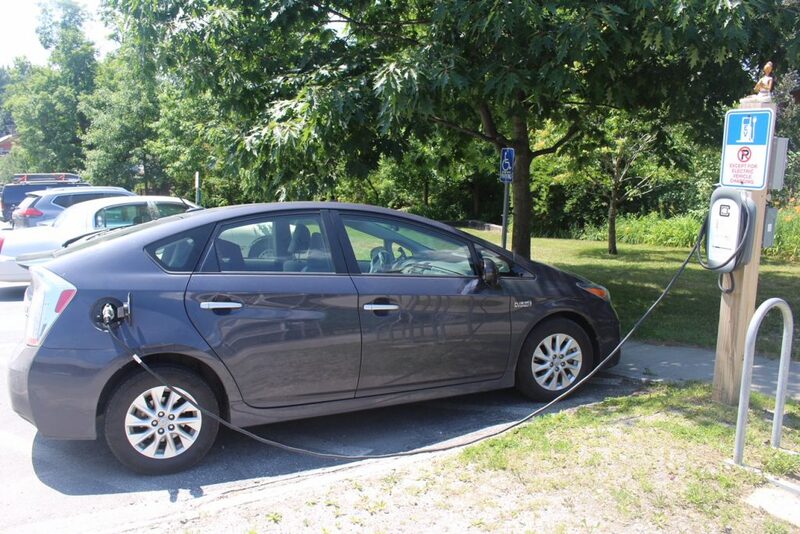 Rep. Welch looks to expand “subsidies for electric vehicles as ‘green’ claims fade! syndrome. Free Money for a useless program that won’t amount to a hill of beans. for these charging stations, why aren’t these vehicles owner footing their own bills? use is coming from the same power plant? The below table shows the average annual miles travelled by EVs is 9642, about 28% less than the 13433 of ICs. This is likely due to EVs being mostly used for local trips (because of a lack of range) and ICs being used for local and longer trips. See table. The Chevy-Volt has a large capacity battery and travels, on average, about 74% of its annual miles in electric mode. See table. An upstate New York owner of a Tesla Model S measured the house meter kWh, vehicle meter kWh, and miles for one year. There was significant kWh/mile variation throughout the year. His real world annual average was 0.392 kWh/mile, house meter-to-wheel. The Model S has regenerative braking as a standard feature. The owner did not take into account the source-to-house meter electricity losses. – Owners may use 0.392 kWh/mile, or less, in other US regions. – New EVs would use less kWh/mile than older EVs, due to battery system degradation. – Data, as measured by owner in New York State, covers only the driving energy. The embedded CO2, about 12.70 metric ton of CO2, is ignored. With snow and ice, and hills, and dirt roads, and mud season, 4-wheel/all-wheel drive vehicles, such as SUVs, ¼-ton pick-ups, minivans, are a necessity in rural areas. Here is a list of plug-ins. Very few have 4-wheel/all-wheel drive and some of them cost 1.5 to 3 times as much as a Subaru Outback, which has all-wheel drive. Range after a fill up is about 530 miles in summer, a little less in winter. Driving an EV in winter, with snow and ice, and hills, and dirt roads, and mud season, and at low temperature, say – 10 C, with the heat pumps heating the battery and the passenger cabin, would be very sluggish going, unless the EV had a large capacity, kWh, battery. The additional stress would cause increased battery aging and capacity loss. There are EVs, such as the Tesla Model S, $80,000-$100,000, with 75 – 100 kWh batteries, which offer road-clearance adjustment and all-wheel drive as options, but they are out of reach of almost all Vermonters. Driving a plug-in hybrid in winter, such as a Toyota Prius Prime, 54 mpg, would be much better, but it does not have 4-wheel/all-wheel drive, a major drawback; the major reason I drive a Subaru Outback. Plug-ins increased from 88 in July 2012 to 1522 in January 2016. Pure EVs totaled 330, about 330/1522 = 22% of all plug-ins. The plug-in increase was about 1522 – 1113 = 409 from Jan. 2015 to Jan. 2016. New vehicle registrations were 41000 in 2016. Plug-in registration was about 409/41000 = 1.0% of all new vehicle registrations. The VT Comprehensive Energy Plan goal is 4700 new plug-in registrations in 2025. See page 164 of CEP. It is likely, about 78% of the plug-ins would be hybrids. People favor hybrids over EVs, because EVs just do not have the range and are terrible performers under Vermont winter conditions. Almost all studies compare ICs and EVs, as if they traveled the same number of miles over a period of years. This is a serious error, because EVs travel, on average, about 9642 miles per year and ICs about 13433 miles per year, i.e., EVs travel about 28% less miles than ICs. See Appendix. NOTE: The average annual miles driven by a driver is 13,476. In actual practice, EVs are mostly used for shorter trips, because of a lack of range, but ICs are used for short and long trips. That means a second vehicle, which may be owned, leased, rented or borrowed, is required for 13433 – 9642 = 3791 miles per year. – The increased internal resistance of the battery, which means more electricity/mile is required as the battery ages. – The embedded energy, and resultant CO2 emissions, of the vehicles. This comparison accounts for all of the above 5 items, which significantly reduces the CO2 emissions advantage of an efficient EV over an efficient IC. Every month InsideEVs tracks all the plug-in EV and hybrid sales/deliveries for the US by automaker and brand. This partial list shows the best sellers at the top are EVs with big batteries and long ranges. That means upscale households what can afford these vehicles want a driving range of at least 250 miles. Welch talks about subsidies as if the money were coming from Mars. Wake up Welch, the money is coming from the pockets of many folks who have no interest in EVS. Further, Rachel has got it right. All the talk about “EV green” and not one word about the tons fossil fuels required to create the ” free” electricity proveded at charging stations. Take away the freebees and see how long the EV fad will last. Mr Musk is laughing all the way to the bank. Batteries for electric cars are NOT Green. The electricity to charge these vehicles comes largely, if not completely, from fossil fuels. When the government uses our money to prop something up that has not been supported by the free market – it’s called crony capitalism. A subsidy for an EV. Time to go get a free golf cart I guess. What a sham. If you want an EV, buy an EV. Don’t make the rest of us pay for it. Love my Honda Civic. Gets 35-37 mpg. If it weren’t for subsidies, you couldn’t give these cars away. The Democrat Mobile.